The picture of me playing my banjo on the back of my Street Bob came as a result of all the ribbing I get for playing the banjo. And yes, I know the difference between a Harley and banjo. (You can tune a Harley.) I think this answers the age old question, "yeah, but can she play the banjo while riding a Harley???" Well, to be honest, no I really CAN'T play the banjo while riding. If I have to choose between strumming or throttling...I'd rather be throttling. 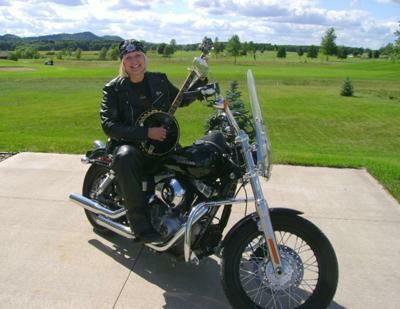 People can make fun of my banjo, but in my humble opinion, I think the black banjo accessorizes pretty darn well with the black leathers and bike. Wow, what a great story! When I travel I like to visit the HD Dealerships to see what they have and I often enter the raffles they have. I always wondered if anyone really wins those things, but you have answered that questions! It's a beautiful bike, enjoy.